World Environment Day is celebrated on 5th June every year. It is the day people all round the world are made aware about the severe looming problems that plaque our beautiful planet. In a world that is fast paced, we often forget to take moment to appreciate the little things our planet has to offer. We rather deem these resources as our birthright, and not what they truly are –valuable gifts. 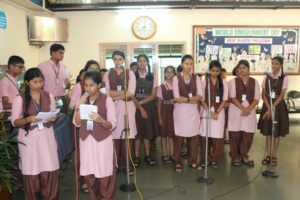 The students of class 12 A were given the responsibility to brief the importance of this day through the morning assembly. The assembly commenced with the universal prayer followed by the prayer song. “All things bright and beautiful”. The thought for the day was presented by Rachel and Karuna .Kini read out the new headlines. 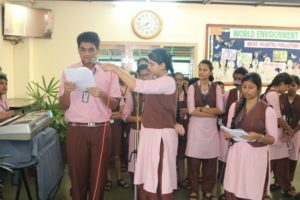 Next Yatin Satish broached the topic on how excessive plastic usage has resulted in the degradation of our world. 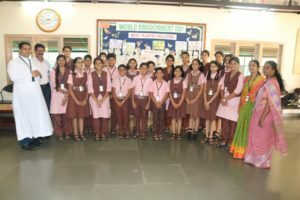 The school Principal Rev. 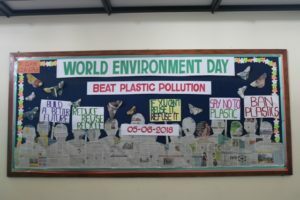 Fr Robert D’Souza encouraged the students to take steps that would help sustain our environment which would eventually lead towards a better future. 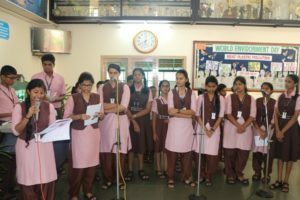 The MC Sonali Umanath concluded the assembly by urging the students to work to be remembered as someone who made the Earth a little more beautiful. This year, as we celebrate ‘World Environment Day’ let us bear this thought in mind. “If we can’t reuseit, Refuse it”.